In previous posts I’ve shown you a video of Cordero Farms and a link to Country Garden Farm, two of the Lost City Knits Oklahoma Fiber Partnership farms. A photo visit to those farms will be shared soon. Today Chris is shipping off two more boxes of clean raw fiber to the mill for me to be spun into fabulous yarn for Lost City Knits customers. 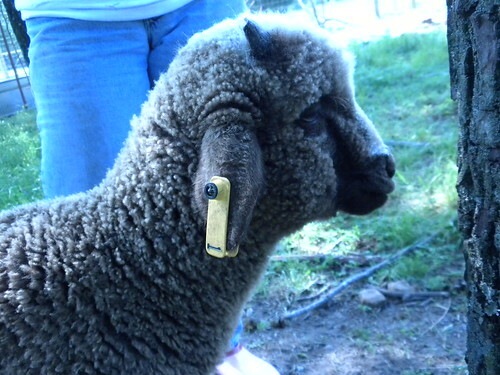 When those boxes return we’ll have East Friesian wool, llama, and alpaca yarn on hand! Some of it will be spun with bamboo, silk, or tencel, some hand-dyed and some will be offered in the natural colorways that represent the animals themselves. I’ve got more fiber left to skirt, clean and pick but I thought you might enjoy seeing what else Lost City Knits has been up to lately. 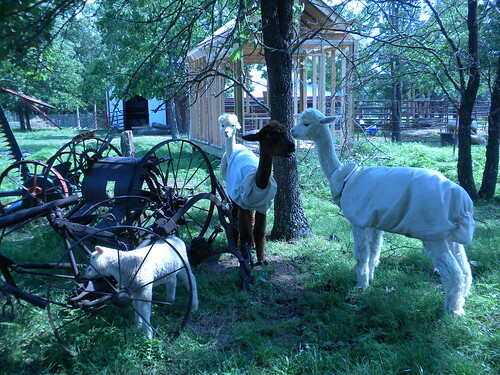 Recently I picked up more fiber at another Oklahoma farm, Heaven Sent Farm in Welling, Oklahoma. Coleen, one of the owners, was gracious enough to give Chris and I the grand tour. 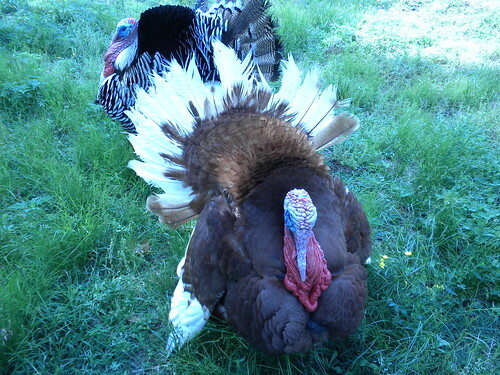 Even before we met Coleen though these beautiful turkeys caught my eye. Aren’t they grand! When I asked if I could visit, Coleen told me their farm was a work-in-progress. She and her husband moved to Oklahoma from Texas. I think Coleen is enjoying her exodus from the corporate world in a big way! I don’t know how she does it all – but Coleen is a dedicated food and fiber farmer. 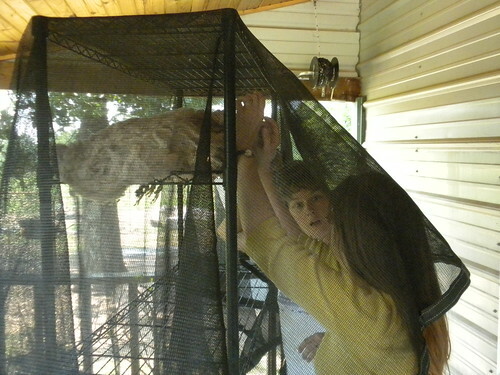 Here’s Coleen introducing us to one of the youngest members of the flock. These guys were basking in the sun enjoying the morning. 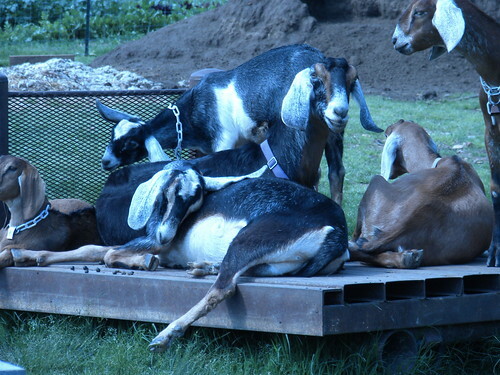 They are part of the goal that Heaven Sent Farm has of living a fully sustainable lifestyle. Some animals just are naturally photogenic. This little guy is posing perfectly still for his photo op. 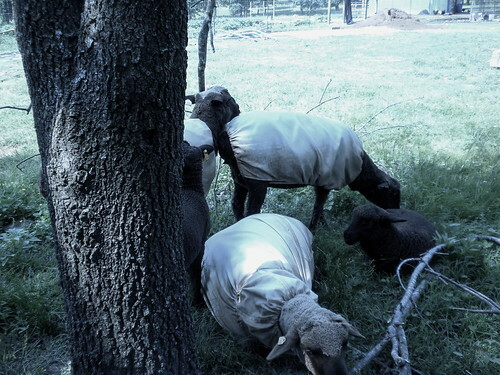 While we as humans like to wear wool during the colder months, these sheep have to wear it year round. 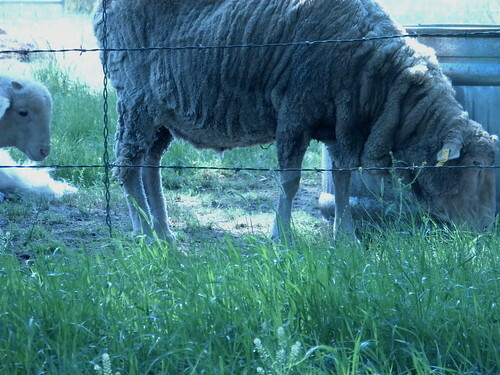 They’ve been recently shorn, but you can see that Coleen has found a breathable summer coat for her flock that helps keep the fleece cleaner (thank you!) even while the animals are outside enjoying our Oklahoma weather. After touring the pasture, Coleen invited me to check out a fleece she had drying. Yes, there was fondling of fiber and excited fiber geek talk going on. It’s my hope that we’ll have enough Oklahoma Fiber Partnership Yarn soon to be able to offer it for sale on this website for those people who can’t make it to the Cherry Street Farmers Market in Tulsa but have a sincere desire to purchase hand-dyed and natural Oklahoma yarn. We hope you check out the links to all of our Oklahoma Fiber Partnership farms. Coleen is an experienced spinner and offers not only hand-spun yarn but fiber for handspinners. She can be found regularly at the Tahlequah Farmers Market.